One thing I’ve come to appreciate here in the UK more than ever before is cider. I’ve had it before and enjoyed it, but something about the huge selection and perfected recipes of the Brits are just killing me. In the best of ways. There are two in particular that I merely need to think about in order to make me salivate. The first is Strongbow’s Cloudy Apple. 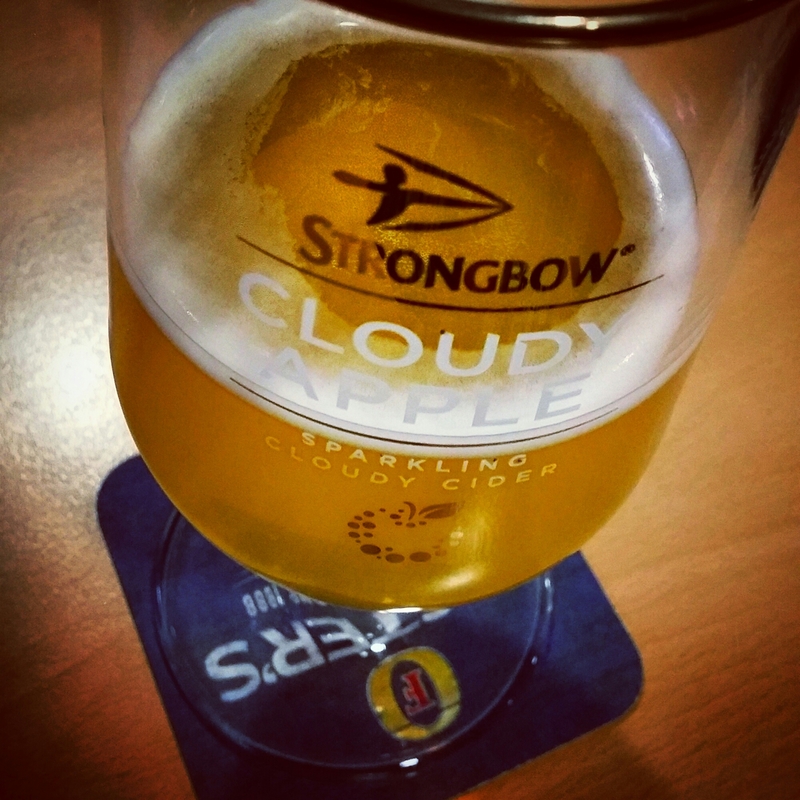 I’ve had other Strongbow varieties before, but the Cloudy Apple is a perfect mix of refreshing and apple flavoured (not a fan of when cider just tastes like weak lager). It’s nice if you only want a hint of sweetness. Sold on tap, the only place I’ve encountered it is at the workman’s club that Ricky’s dad is a member of. The second is Old Mout cider (pronounced, as the bottle instructs, Ohld Moot). This one’s by the bottle so it’s a little easier to find, but not always. It’s a fancy (and somewhat expensive) artisan cider so it’s usually sold in places of according trendiness. It’s very much on the sweet side to the point that it almost tastes like a wine cooler, but at 4.5% alcohol. They’ve got a whole range of awesome flavour combos including pomegranate & strawberry (my favourite), passionfruit & apple (my second favourite, pictured above), summer berries, and kiwi & lime. I get this one mostly at Ye Old Pumphouse down in the Hastings Old Town and it’s just heavenly on a warm day poured over ice after walking on the seafront. A few bad hangovers in Korea along with my struggles to eat healthier has made me sort of quit drinking alcohol as readily as before. But between these two ciders, the seal has broken once more. You’d think Canada (and Vermont) would have a lock on all things cider! Seriously! But it needs to up its game on Britain. I must sample some and then do some serious comparisons. So wondrous. I have dreams about them.